Purpose (created 1/29/04 and updated on August 2, 2005) To minimize and/or mitigate the hazards associated with the combination of vehicle, heavy equipment, rolling stock and pedestrian traffic. 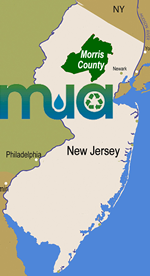 Note, The Morris County Municipal Utilities Authority’s (“MCMUA”) Transfer Station located in Parsippany-Troy Hills Township (“Par-Troy”) consists of two properties divided by a public roadway. To the East Side of Edwards road is the inbound staging area, scales, scale house and tarp rack. Out bound traffic exits the scale and facility to New Edwards’s road. On the west side of Edwards road is the main transfer station and tipping floors. This building consists of a large tipping floor, a small tipping floor and four loading bays where transfer trailers are backed in to be loaded at half the level of the tipping floors. Collection Vehicles - Collection vehicles enter the site from New Road, stop at the stop sign make a left then another left into the main entrance gate and come to a complete stop before entering the inbound scale. They then make a right hand turn off the scale where they will stop at the stop sign. At this time roll-off trucks can untarp the boxes and are directed by the spotter to the tipping areas. When the floor inspector (MCMUA Employee) signals the truck to the tipping floor, the driver will rely on the traffic coordinator to stop traffic to allow him to cross the roadway. Once across the roadway the floor inspector (MCMUA Employee) will back driver into the assigned door. The trucks are to open their doors on the tipping floor and close them before they leave the tipping floor. At no time is the loader operating in the same door as the trucks or cars unloading. When the truck is finished unloading the driver will wait for the floor inspector to release him and wait for the traffic coordinator to stop traffic to let him back into the roadway to access the outbound scale lanes. Once the driver scales out and receives his paperwork, driver is to leave the facility. All yard jockeys which move trailers around will follow the same plan. They will rely on the traffic coordinator through radio communication to help them cross the roadway and spotting of trailers in the yard. Transfer Trailers - Third party empty transfer trailers enter the site via same access as collection vehicles and proceed to the traffic coordinator. The traffic coordinator will direct the driver to drop the trailer in the appropriate spot, depending on availability of parking spaces. The yard jockeys hook up an empty trailer and pull forward in front of the loading bays to await direction from the traffic coordinator as to when it is clear to back into the loading area. Communication is established by way of two-way radio and/or eye contact with the traffic coordinator. The traffic coordinator shall also carry a stop/slow sign. Jockeys are not to proceed with out response from traffic coordinator. The jockeys will communicate to the equipment operators when the trailer is backed in to the loading bay and ready to be loaded. The operators will load the trailers and communicate to the jockeys via two-way radio that the trailer can be removed for final scaling and ticket generation. Once the trailer is weighed out the jockey will proceed to the tarp rack. The jockey will drop his trailer in the tarp rack and hook to the other trailer that was previously tarped. The jockey will proceed to the loaded trailer staging area and drop the trailer. The third party hauler will then hook the trailer and proceed to the scale house to sign out the load at this point they will exit the facility in route to the designated disposal facility. All trucks entering and exiting the tarp-rack must use caution as to where the tarpers are located. Speed is to be at a minimum while travailing through the tarp rack. Trailers are to be dropped with the brakes set and wheels must be chocked before tarping. An orange safety cone will be placed in front of the trailer to be tarped this shows the driver that the trailer is not ready to be pulled. If a trailer has to be tarped with a truck hooked to it, the truck must be safely secured; engine off, key in pocket, brakes set, wheels chocked. Tarpers are to clean all loose debris from top and sides, pull tarp onto the trailer. Three-point contact must be maintained as the tarpers go up and down the stairs at the rear of the rack and as they work their way to the front of the trailer connecting the bungee cords. This puts them at the front of the trailer to communicate with the driver and to remove the cone indicating it’s ready to be removed from the rack. The driver must know the location of the tarpers BEFORE moving the truck. All tarpers must wear proper P.P.E. ; SAFETY GLASSES, HIGH-VISABILITY CLOTHING, PROPER SPEC WORK BOOTS AND LEATHER PALM WORK GLOVES. Tarpers are also to avoid contact with the waste in or on the trailers, using the supplied OSHA approved fire gaffs. Don proper personal protective equipment: safety shoes, hardhat, high visibility vest/clothing, eye protection and work gloves. Drivers will be directed to open their tailgate while in a zone as far in front of the trash pile as practicable and closing of the tailgate will occur in the same zone. Only one person can exit the truck on the tipping floor (except for hand unloads). The driver who exits the vehicle must stay within 6 feet of the vehicle. When closing or opening swinging doors, the driver is the stay with the moving door until it is properly secured. Vehicles are not to be left unattended. Conforming safety chains must be used to hold open roll-off container doors while unloading. Use of bungee cords, wire, ropes, etc. will not be permitted. Drivers/haulers will only back into an area to dump prepared by a heavy equipment operator only after instructed by the operator or traffic coordinator. The driver is responsible to be certain the truck is parked on a firm and level surface before disposal. A fifteen-foot safe zone must be maintained between heavy equipment and trucks working on the tipping floor. Never walk behind or in front of another vehicle unless you have made eye contact and received confirmation of intended movement using hand signals with the operator of the vehicle/equipment. Make certain the area has sufficient clearance for the truck to enter, exit and tip. Tailgates, bodies, and hoists should be lowered before exiting the building and especially for compliance with our DEP permit. Equipment should not be moved around with the tailgates, doors, hoist, or bodies’ open or in the extended position. No one is allowed under a raised tailgate without proper block out, a t-bar or similar device. Never walk under or allow anyone else to walk under a raised tailgate for any reason. To help ensure no one walks under the tailgate, only open the tailgate approximately 2 feet when cleaning the tailgate seal. If a load being dumped is frozen or jammed, drivers must ask the floor spotter for assistance from the heavy equipment operator. The driver must stay inside the truck until he/she is signaled by the floor spotter or by the horn from the equipment operator that the load is free and clear of the vehicle. If driver needs to perform a truck clean out; ask the floor spotter for guidance to the designated clean out area. Promote safe and orderly traffic flow into and out of the site, into and out of queuing/staging area and into and out of the transfer building area. Be in position to both see the immediate hazard area and be seen by the driver. If the Traffic Coordinator must change positions during the maneuver, signal the driver to stop, move to the new position before the maneuver is continued, and maintain visual contact with the driver. Is in radio communication with floor spotter, Scale House, Heavy Equipment, Yard Jockey Driver and site management. Whenever feasible position one’s self in a safe haven or buffer space that is designed to separate you and others from traffic such as behind a concrete barrier, booth or designated pedestrian zone. Assign tipping area locations for incoming vehicles. Direct hand-unload customers, A 901 Exempt vehicles, and non-tipping vehicles to appropriate and safe unloading areas. Maintenance personnel will make every effort to move the piece of equipment requiring service off the tipping floor, notify operations personnel of their location and work within close proximity of their service vehicle. If the piece of equipment requires servicing on the tipping floor, operations personnel will be notified and work will be directed away from the area of the maintenance work. Traffic cones and/or caution tape will be used to identify the work area. Other Waste Management personnel on the tipping floor for investigative purposes will establish contact with operations personnel to create an awareness of their location and their purpose in the tipping area. If possible, operations personnel will direct work away from the general area of the investigation. If it is not possible to create a safe zone because of the size of the tipping floor or the location of the investigation, all work must be halted until the investigation is complete and personnel have cleared the floor. To minimize vehicle stability concerns, dump body trailers will be directed to an area away from other customer’s vehicles and heavy equipment. Hand unload customers and all A901 Exempt vehicles will follow the same procedures as directed by the floor spotter, however they will be in an area separated from commercial vehicles while unloading. This area is along three bay loading walls on the main tipping floor. Use of the small tipping floor is approved by the DEP and MCMUA for these customers when the floor is being utilized for tipping. Special precautions must be followed when towing and pulling stuck trucks. A piece of heavy equipment will not push a truck. This is an unsafe practice. Stuck vehicles will be pulled by a cable/chain/sling by the heavy equipment. The driver of the truck is responsible for hooking and unhooking the cable/chain/sling to their truck. Clean up / spill response equipment (absorbent materials, shovels, brooms, socks and PPE) is placed in designated areas and clearly marked. Operations at a transfer station create the potential for undetected hazardous materials to enter the facility in solid waste loads. It is the responsibility of every employee to be aware of questionable wastes and to ensure that proper recognition and identification of these wastes. This facility has procedures in place to reject loads that contain hazardous materials, responding to hazardous materials spills and contacting the appropriate hazardous materials response agencies in the event of a spill or release. In the event of a fire on the tipping floor, the traffic coordinator, floor spotter or heavy equipment operator will immediately prevent any other vehicles from entering the tipping floor. The Traffic Coordinator (“TC”) or Operator will instruct the scale house to direct inbound traffic to proceed to the queue area and wait there until being instructed further by TC. The scalehouse will then notify the facility manager of the situation. Site personnel will follow the site-specific emergency evacuation procedures. Regulatory Inspectors on the tipping floor for any purpose must be escorted at all times by facility personnel and contact must be made with operations personnel to create an awareness of their location and purpose in the tipping area. If Regulatory Inspector must step onto a tipping floor, all equipment operators must cease until all personnel clear the tipping floor. All visitors are required to report to the scale house and sign in and out on a visitor’s log. Visitor’s will be accompanied at all times by facility personnel and wear a high visibility traffic vest, hard hat and safety glasses. All pedestrian traffic will be confined to a designated area. The pedestrian walking zones are clearly marked in white paint. Vehicular traffic is prohibited in the pedestrian walking zones. Violations of Post Collection Tipping Floor Operating Procedures and Policy will be documented and forwarded to the employee’s/customers direct supervisor in order to follow up with re-training and/or discipline as required. We are required to adhere to all Federal, State and Local regulations and to provide a safe, healthy and sanitary workplace. Each of us has the responsibility to make the safety of our co-workers, our customers and the general public a primary concern; this objective is fundamental to the MCMUA and it's employee’s well being, as well as the efficient operation of our facility. Hardhat, high visibility clothes/reflective safety vests, safety shoes and eye protection are to be worn when outside the vehicle. All vehicles must comply with the posted traffic signs, with special attention to the posted speed limit of 5 MPH. All vehicles must come to a full stop before proceeding onto the scales. A minimum distance of ten (10) feet must be maintained between all personnel, trucks, rolling stock and heavy equipment with in the facility except on tipping floor see rule #18. All commercial solid waste vehicles entering the facility shall be equipped with external audible back up alarms; a minimum 85 dBa alarm must sound whenever the machine is in reverse. Loads must be tarped prior to entering the facility. Tarps are to be removed in designated remove tarp areas only. Under no circumstances are tarps to be removed before entering the facility. Drivers preparing to enter tipping areas must await directions from the Traffic Coordinator and/or Heavy Equipment Operator. Driver is to maintain eye contact with operating personnel. Blind side backing is not to be attempted without guidance. Passengers and Helpers must remain in the cab of the vehicle. Drivers must stay within six feet of their vehicle when outside of their vehicle. When out of vehicle please keep clear of tipping area bay door(s) as loader will be backing out. Riding on the outside of the vehicle or standing on the vehicle rear step is forbidden when vehicle is moving on site. Cleaning out from behind the blade of a vehicle (truck cleanouts) must be done in designated clean out areas separate from the work zone. While dumping the load, stay clear of the back of the vehicle. Never stand under the open tailgate or raised hopper. Tailgates, bodies, and hoists should be lowered before exiting the building to ensure compliance with DEP permit. Equipment should not be moved around with the tailgates, doors, hoist, or bodies open or in the extended position. All open top trucks must be completely empty before exiting the tipping floor. The backs of packer trucks and roll-off containers must be opened and closed on the tipping floor. The operator/driver of a vehicle needing to be pulled shall hook and unhook the towing equipment. Pull hooks should be mounted on the front and rear of all refuse vehicles. “Jake Brakes” may not be used on site at any time. Heavy Equipment Operators have the right-of-way on the tipping floor. All vehicles are to yield to operating machinery and pedestrians. A fifteen-foot safe zone must be maintained between heavy equipment and trucks working on the tipping floor. (15-foot safety zone cannot be enforced without closing 2 bay door from tipping and the MCMUA will not allow this). Conforming safety chains must be used to hold open roll-off container doors while unloading. Use of bungee cords, wire, ropes, etc. will not be permitted. All passengers must remain inside the vehicle. No children. No pets. Do not pass moving vehicles. To increase visibility, it is required that headlights and 4 way flashers be operating during disposal. Report all injuries/accidents to the Traffic Coordinator or at the scalehouse. Smoking is prohibited while outside your vehicle. Horseplay, scavenging or picking through the loads is strictly forbidden. Firearms, and/or weapons of any type are not allowed on the property for any reason. The use of intoxicating beverages or any other restricted substance on the facility is strictly prohibited. Photography is prohibited unless there is written permission from the MCMUA. All visitors must check in at the scalehouse and/or main office. Drivers are not to use cell phones or two-way radios while driving on the transfer stations’ property, especially during a backing maneuver. In the event a post collection employee needs to enter the tipping area on foot, all movement of equipment and vehicles must stop before and during this process. Movement cannot resume until the person(s) on foot has communicated to the vehicle operator(s) that the ground is clear. Radio, tape or CD player earphones are not to be worn. Upon entering the facility all collection vehicles must yield to any transfer trailer traffic going to the inbound scale.